Fall is finally upon us here in the Pacific Northwest. I’m not going to deny it anymore. But even as the weather gets cooler, my family and I are still finding ways to get outside and play. I have always loved playing outside, climbing on rocks, trees, hiking, and splashing in puddles, and really want to pass this love of nature and outdoor movement on to my kids. It is so great to see other parents encourage their kids, and other grown-ups, to discover and recover their biophilia and love of playing outdoors. 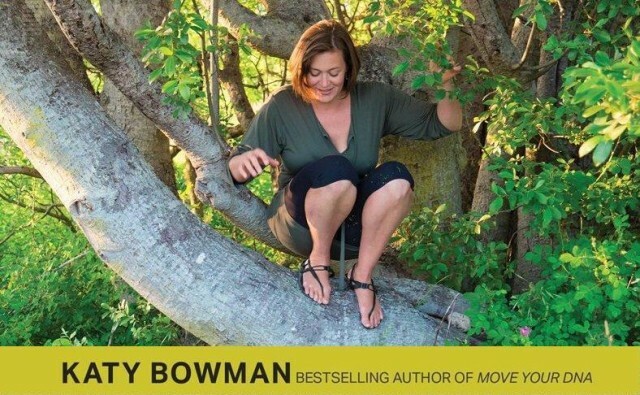 One of the best outdoor play advocates I have met in a long time is Katy Bowman, although for her, moving and exploring the outdoors is simply behaving like a normal human. Katy is a biomechanist with a deservedly large following of movement practitioners using her Restorative Exercise program. Katy is a huge advocate of natural movement and getting outside as much as possible, and encourages it with her kids as well. Katy talks about their experience in their outdoor “nature” preschool on her blog and podcast, but the enriching environments she has set up for her kids at home is in a class by itself. Katy graciously invited my family out to her house outside of a small town on the Olympic Peninsula earlier this summer. When we pull up to her house, the front yard looks fairly typical for any house containing small children; a few toys are strewn around the yard, slightly hidden by the uncut grass. Her husband and children have just headed off down the road for a walk. She helps us unload our brood out of the car after the long drive and immediately invites my daughter to explore, with me in tow. We step out of the house into the backyard, and it is perfect. My three-year-old daughter’s eyes light up like she’s hit the motherlode. The lawn is littered with toys – costumes, stuffed animals, balls, a Little Tyke’s scooter car. There is a big basket of LEGOs sitting on the porch waiting to be dumped over and played with. There are also complex toys laid out intentionally by Katy and her husband Michael for her kids to play with. A tippy rope ladder strung between two trees with a foam mat underneath; ladders laid on the ground for balancing, a jungle gym, a circle swing, large wooden ramps placed strategically up to table tops. The cherry tree is also filled with cherries, for good measure. The kids have gotten creative with some of their building materials, including taking a couple of blocks from the flower box and made a corral for their plastic farm animals. They have also left little illustrations stealthily added around inside the house: on the wooden bed frame, the balance ball in Katy’s office, and on a couple of door frames. And that’s before we even meet the chickens or go down to the Dungeness River to throw rocks, wade, climb, and make structures in the sand. It is obvious the kids have the run of the house, and its affect is wonderful. Katy has created a practice based on her high level training in biomechanics and years of teaching experience centered on creating a healthy, mobile human being, and this practice is reflected in how she and Michael have set up their home environment. Every space is open for movement, jump, climb, and play. There are edges and imperfectly balanced steps and slight risks everywhere. The kids must learn to navigate their environment safely, and have a blast doing it. Katy often talks about getting her kids outside and exposed to new, playful challenges. And yet, when I ask her about it, she almost baulks at the idea she is supporting a primarily “playful” environment. For her, this is simply survival, teaching her little humans how to be human. She is merely creating and supporting healthy behaviors, what kids and grownups should be doing all the time. They let their children go slow, at their pace. Their kids learn by doing, by experiencing. As do we all, really. It’s true that, thanks to the visit, I now have more confidence in being able to ford a fast-moving stream carrying my toddler. And it wasn’t part of a survival training camp or an emergency. It was part of our Sunday family outing. It may sound small or frivolous or “not necessary,” but for the survival of our species, that skill is a big deal. To me, this kind of activity is not just good for restoring our body and capability to move, it is also restorative to our psyches and filling that need to explore and play at our own pace and learn in a playful way. Finally my family has to head home. We take the time to let our kids say good night to the chickens before we load back into our car, driving away with the sunset on our backs. After getting to see and play in Katy’s backyard, both the grown-ups and the kids in our family feel renewed, replenished, and ready to play and explore our own backyard and our home environment in a new way. I highly recommend digging in to Katy’s materials. She has some great ideas and thoughts around leading a healthy, restorative, and in my mind playful movement practice, whether it’s in nature or just in your own backyard.